This idea has been on my mind a lot lately. I think it is because I have a fourth child and anytime you add a child to your life, you add another responsibility that takes up a lot of time. Any time you add a responsibility that takes up a lot of time, you have to find that time from somewhere. Unfortunately, there wasn’t a lot of time I spent idle, so that time has to come from something I was doing that I wanted to be doing and felt I needed to be doing. Where do you take it? What has to give? Do you drop something all together or do you give a little less to multiple things and hope they all work out? I think an important first step is accepting that you cannot do everything. And that is so hard! The problem is, like this quote says, you can do anything. You can! Anything you want to do, you can do it. And because of that, you can want to do everything! 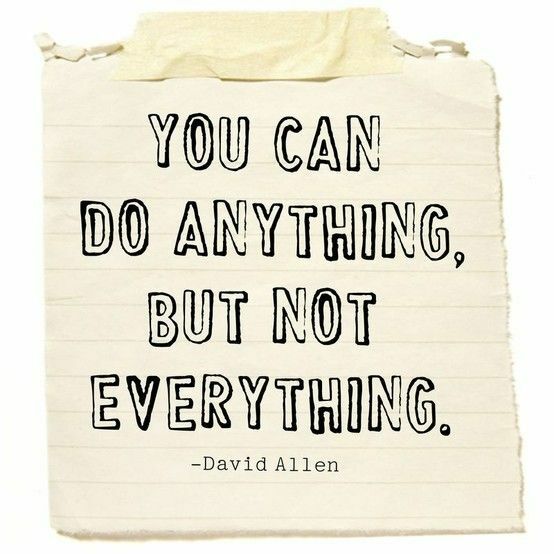 You can want to be an excellent cook, impressive cleaner, fun mom, wise mom, gardener extraordinaire, fitness guru, on-time scrapbooker, splendid seamstress, PTA president, queen of service, and one of those people who actually does 1% of what she pins on Pinterest…But you can’t do everything. You can’t do it all. You just don’t have time for it. And so you have to figure out what the best things are for you to be doing and start there. You can add in other things if there is time after the best and most important things (but of course it seems like there isn’t!). And so I love this quote. So pick what your anythings are and sit back and enjoy those who choose the other anythings to focus on. And as a side note, this quote also applies nicely to the activities our children participate in. We all have talented children who have a whole future ahead of them. They have the ability to do anything! They have so many options and opportunities! But they can’t do everything, either. This is a great quote and your advice is perfect! Something we all need to be reminded of, especially the part about appreciating the talents and accomplishments of others without feeling guilt or jealousy. I struggle with this all the time. I can't cook healthy homemade meals for my family AND exercise on a schedule AND volunteer in the classroom AND sew AND keep a clean house AND keep on top of all the daily household stuff. It's so hard to admit that. LeighSabey, so true. I think it is a great ability to be able to just look at the accomplishments of others and just be happy for them. Very true Renee! And it is interesting that Martha wasn't doing anything bad. She just wasn't doing what was best at that moment.